Government support for car industry | What Car? 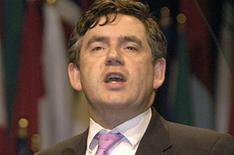 Prime Minister Gordon Brown has hinted that the Government will help Jaguar Land Rover and Vauxhall through the economic crisis. While visiting Liverpool, Brown was asked about Jaguar Land Rover and Vauxhall's Ellesmere Port plant. He said: 'We are talking to the motor industry about what we can do to help. The Government has also pledged to help workers at Nissans Sunderland factory who will lose their jobs due to cutbacks caused by the economic turmoil. Nissan has announced it will axe 1200 jobs, about a quarter of the workforce at the plant. Responding to the announcement, Business Secretary Lord Mandelson said: 'I appreciate that this will be a tough time for workers. We will help any employee find alternative opportunities as quickly as possible. 'We also need to look to the future and our commitment to the development of low-carbon vehicles as an integral part of the UK automotive industry.